EFCC is actually puncturing its success chances at the courts with its penchant for media hullabaloo. There is inordinate media publicity around this anti-corruption movement. In addition, its evidence gathering mechanism is terribly flawed. Too many hints flooding the media space even before key individuals involved in such frauds are formally invited or arrested. It is a rash moribund approach that eventually would not recover one-tenth of stolen funds. I think it is trial by media. Lawyers & courts still have to weigh available evidence. It's fundamental human right to be defended in court. A whole EFFC boss should know that. He can criticise delay tactics but he should gather evidence diligently and make cases watertight using forensics and other available modern techniques. There's a clear difference between lawyers defending criminals and the same lawyers instituting endless and meaningless injunctions to disable and disrupt court proceedings just to make sure corrupt people and criminals never face trials in courts of law. Silly and pointless injunctions doesn't help our judiciary and institutions, it basically paralysis our court systems and render them worthless and obsolete. They don't allow these dubious tactics in the places we copied democracy from especially in America where corrupt top government officials and even governors face trials and sent to jail. Lawyers should be able to defend their clients with their own sets of facts in any court of law if they really are capable and competent enough to do so, but these lawyers are not willing to do their job, they are basically not even trying and have never tried to do their job, all they do is derail, cripple our court system and proceedings. Look at Saraki's last move at the SC. We know these top SANs are not dumb enough to know which and what court of law decides which and what cases, they went to the SC to string out the trial, delay, stall and make sure that our judicial system doesn't function the way it was designed to and because of their idiocy and crooked method, justice for Nigeria was delayed needlessly. This is why we have criminal trials lasting for 10 years or more, this is why they weakly reformed the judicial system to get rid if these dubious tactics and delays that paralyzed our judicial system, obviously, they didn't go far enough to stop it completely. I've never seen anywhere on the surface of the earth where a corrupt politician and crime suspect was given perpetual and everlasting injunction preventing any law enforcement from touching him. This is when corrupt lawyers and judges create super, untouchable and above the law Nigerians. Many lawyers, SANs and judges in Nigeria today are nothing but crooks and destabilizing elements bent on making sure our judicial system doesn't function. He went to the University and graduated, went to the law school and passed out, started practising law and later became a SAN, and an NBA chairman and you are questioning his competence just because he is practising his profession? Lol I never knew that a man can achieve all these by being incompetent. Mr man I think the shame is on you to have questioned a man who has become successful in his chosen career. The question is: Are you successful in your chosen career just like him? Oga, go and sit down. We all saw his performance when Rotimi Jacobs was teaching him how to perform in court quoting wrong sections of the constitution. He is a specialist in derailing court cases and seeking for frivolous injunctions. Saraki is on his own. I can buy my way up there and you will come and celebrate me being successful. Remove character from the certificates and you will end up with a mere sheets of paper. He is sounding like his principal, pmb. MagU wants to win every case in court without opposition. Are you one of those senior lawyers or one of their relatives? It's all the hallmark of our national life - incompetence and ineptitude everywhere. So Magun wants people to be jailed without being given a chance to defend themselves and he called that JUSTICE? Na wa o! A CITIZEN HAS A RIGHT TO FAIR HEARING IN A COURT OF LAW SO THAT THE PROCESS PRELUDE TO CONVICTION WOULD BE SPOTLESS. THIS IS WHAT HAPPENS IN A CIVILIZED SOCIETY. Have they done anything outside their professional duties? Don't mind him. If he himself gets in trouble with the law, it would be interesting to see whether he will not run to the same senior lawyers to defend him. He's just trying to play to the gallery. I don't know much about Magu's life history,apart from his detention at one time for seemingly being too diligent in his work,but hearing him talk sometimes gives one the impression of someone that has had some personal family tragedy arising from the corrupt deeds of some pple in high places and is therefore out to bring to book the corrupt and anyone that stands in the way of the corrupt being brought to book. Great. So he was detained. Was he by any chance represented by a lawyer? Just see how many indigent and jobless youths are attacking Magu for his passionate talk about EFCC prosecution. You people will really see suffer for a long time. Stay here with empty stomachs and be attacking someone who is gainfully employed. Excuse me! It is actually a disgrace to have over 30 Senior Advocates of Nigeria defending one man - where is their conscience for christ sake. He is sounding like his principal, pmb. MagU wants to win every case in court without opposition. Dictatorial mentality. Not just without opposition but without proving the accused guilty in court. U can go ask him in his office. Teenagers like you should be reading their books to pass exams not being on nairaland abusing others.I think Seun should find a way to filter people's age in this forum,too many 90s kids in this forum abusing people upandan. Dauda Joseph!! A former NBA president currently defending Saraki, Dasuki and Gabriel Suswam. The annoying part is that he knows next to nothing but specializes in seeking adjournment and delay tactics. Challenge him to do an impromptu address to the court; no way, hey cant; why? because he was never fit to be SAN in the first place. Go and watch his display at CCT during Saraki's trial last year. That's exactly what the EFCC boss is saying. He's not talking about why representing the looters but their delay tactics that make cases drag for too long until it loses the steam. But morons here wouldn't want to understand. Tell me somrthing!!! So what is stopping him from going after Fashola and Amaechi? He's wrong. They are innocent until proven otherwise! That's what lawyers do. God is ultimate judge, however. Magu do ur best and leave d rest for God to finish. more greese to ur elbow. How can they get enough evidence when pple they are investigating are more powerful than d country. They own d police,d media,d banks,d telecommunication,d court even human evidence could be bought. How can they prosecute effectively in dis regard. Even d little one they are getting right,i give kudos to them,dis pple are trying.Nigeria is not yet there like developed country that u'll want to follow all d law to letter,yam eaters would just frustate all ur efforts.Politicians have destroyed dis country,courtesy of PDP. Magu is under Iju weed! He must be silly with this type of statement! So, the lawyers shouldn't defend anymore in the court? While I frown @ embezzlement and every looters must not go unpunished, lawyers shouldn't be intimidated in defending their clients. If a man murdered anoda man before my eyes and den came to me seeking my legal services as a lawyer, I would be ready to defend him I court. And, don't in any way relate dis to corruption! Zombie keep shut ! Can your father even produce the said N100 comfortably ?. Dude, you need to cleanup the judiciary system if you want positive result. 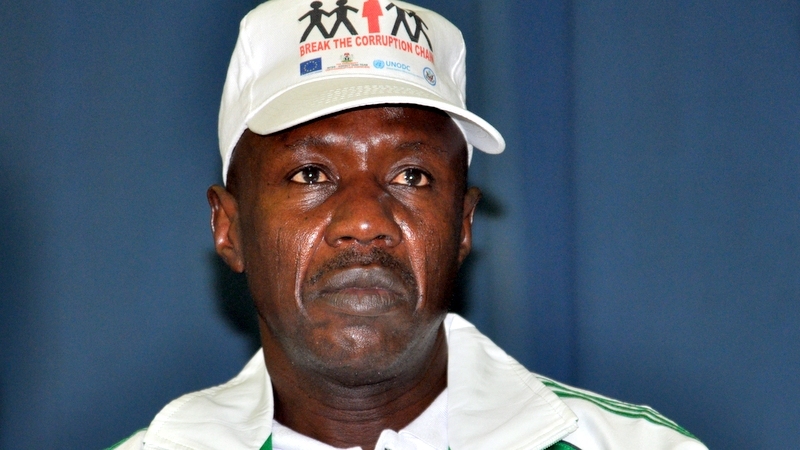 The acting Chairman of the Economic and Financial Crimes Commission (EFCC) Ibrahim Magu Tuesday said senior lawyers collect stolen funds to frustrate prosecution of corruption suspects. Magu said this in a speech delivered to a coalition of Civil Society Groups that rallied to the EFCC Headquarters in Abuja. “Give them part of the stolen money and mobilise them to fight us, to delay us in court and to deny Nigerians of justice. These are the people who do not want justice for the common man,” Magu stated. He noted that the money will be used to do what it was originally meant for, to build hospitals, send children to school, build roads and railways, create employment and defend our country. Na who father pay the School fee? How I Gave Fayose $5mn Cash From Nigeria's Security Funds - Obanikoro / Goodluck Jonathan Is Not Corrupt - APC Spokesperson, Bolaji Abdullahi (Video) / Ogun Poised To Overtake Lagos In Development!